Now that we’ve covered the available replicas of North American license plate fonts (previous page), let’s look at how the fonts were originally designed and constructed and why they look the way they do. Also presented here is a simple classification scheme to make sense of the hodge-podge of different character shape types scattered throughout the various states’ license plate fonts visible out on the highways. Fonts in graphic design and commercial printing/ publishing vs. license plate fonts. Most typefaces seen on everyday items — such as books, magazines, newspapers, brochures, direct mail pieces, most signage (other than roadway signage), or in internet communications such as email, websites, and PDF documents — are created by and for those with experience in graphic design, commercial illustration, and/or sign painting. License plate fonts, however, are created by those trained as draftsmen, mechanical engineers, or product engineers working with the design of industrial equipment and processes. The approach to font design and creation is considerably different for each. Since the “font mainstream” is defined by those working in graphic design, let’s briefly look at how fonts are designed there, then compare that with how license plate fonts are created. Font creation in the graphic design world, past and present. During the decades prior to the shift to personal computers for doing graphic design and print publishing (which began in the mid-1980s), typefaces were drawn by hand. Typically, characters would be drawn either freehand using pencil, ink, and eraser; by cutting shapes on amberlith or rubylith (a semi-transparent mylar-based sheeting) with an X-acto knife; as well as with ruler and compass if appropriate for the particular typeface (those with a more “geometric” look). Then at a later, more technical stage, the drawings or amberlith/ rubylith artwork would be transformed into the printing or typesetting technology of the day. From the first Western printing presses of Gutenberg in the 1400s up through the 1940s or 1950s, this was metal type, after that phototype on film, and still later early electronic digital type in the 1970s and early 1980s. Even after the creation of the first digital typeface production system (by Peter Karow of URW in Germany during the early 1970s), typefaces were still usually drawn by hand to begin with, then digitized later. It wasn’t until after the release of Fontographer in 1986 that type designers started converting to digital creation methods en masse. Even now, some designers or certain kinds of typeface designs may still utilize hand-drawn methods as the best way to initially create the artwork for a given style of font before digitizing it. And even where a typeface may be created from scratch mostly digitally, hand-drawn sketches of initial concepts (sometimes quite detailed) to work out the basic design theme and troubleshoot any design issues might be used to begin with. Drawing tools and the type of people creating fonts strongly influence their design. In the printing and graphic arts industries, character shapes are often very fluid in nature because of the artistic training or on-the-job experience most professional graphic designers in the business typically have. Even where the type designs are geometrically based, optical adjustments and subtle variations in stroke weight are almost always built in to compensate for the quirks of human perception and refine the appearance to the human eye. In the license plate industry, fonts have been drawn by draftsmen, engineers, or others trained in mechanical drawing, however. Ruler and compass rule, so to speak, so everything has for the most part been drawn highly geometrically. The business of license plates has been the business of blueprints, tool-and-die machines, and industrial equipment driven by a mass manufacturing mindset. Without formal artistic training, the approach to font-making has been mechanically driven because that’s how those who have been in a position to draw them have been trained. Only individuals working at the manufacturers supplying the equipment on which the fonts would be used, or who have a special ongoing business relationship with them, are typically involved. Uniform construction with “geometric primitives.” Thus, the much more constructivist, industrialized look of license plate fonts: shapes built from perfectly straight lines, perfectly circular arc sections, and/or oval arcs that can easily be drawn by ruler and compass or other common drafting tools. In recent decades, computer-aided drawing (CAD) software has come into play (typically using AutoCAD), but the approach remains the same. In addition to perfectly straight lines and perfectly circular or elliptical arcs, stroke weights are completely uniform with no variation in thickness, resulting in the industrial monoweight look characteristic of traditional license plate fonts. Multiple “cooks” and competing objectives with license plate fonts = quirky designs. Also, since the fonts were (and still are) subject to a process of approval and oversight (and, who knows, perhaps just plain monkeywrenching) by committee at the state level (DMVs, correctional industries, etc. ), any coherent design plan for a font that may have been present at the beginning can be lost. Sometimes for good reasons (to prevent confusion of two different characters such as D and O when seen from some distance, for example), other times not. A small smorgasbord of varying character traits that don’t mesh together quite coherently can occur. Of course, this can also be part of the charm of industrial products like this — the very quirks themselves can be beguiling to others of us in the sometimes over-designed information age. Curved characters that have straight left/ right sides joined by semicircles (often perfect semicircles) on the top/ bottom. License plate fonts using this construction method are similar in appearance to DIN 1451, covered at length in the section on European number plate fonts and which served as the prototype for many of the number plate fonts in use there. North American fonts based on this theme, though, are typically less consistent in their application of it with more quirks. The look is different, also, due simply to the more condensed character widths of North American fonts. Here, characters that would normally be composed of curved sides are box-shaped, i.e., the bowls have all straight sides on left/ right/ top/ bottom with rounded corners (usually perfectly circular 90-degree arcs). Fonts with this type of construction are similar in concept to the mainstream typeface Eurostile, though of course considerably different in implementation — more condensed and without the refined optical adjustments. For example, the curves in Eurostile connecting its straight sides aren’t perfect 90-degree arcs as with license plate fonts, but subtly finessed for a more refined appearance. Also, fonts for graphic design like Eurostile contain horizontal strokes slightly narrower than verticals to compensate for a quirk of human perception so that they appear equal-width with the vertical strokes to the eye. The character strokes in license plate fonts, on the other hand, are typically uniformly thick with no variance. The mechanical way these design features are handled in license plate fonts is a key factor telegraphing their more industrial appearance, over and above any embossing that might be done. Curved characters that have oval/ elliptical bowls and arcs. These could be compared (very loosely) to the curves seen in mainstream humanist sans fonts. However, license plate fonts of this type retain a strong industrial look due to their mechanically derived AutoCAD-wrought shapes and uniformly-thick stroke weights, with just a hint of humanistic feel. Two potential patterns seen in hybrid fonts. Sometimes a license plate font is a hybrid just because it contains inconsistently designed characters without much of an apparent plan behind it. (Such fonts might be better termed mixtures.) However, there are a number of cases where a font uses one style for alpha characters but another for the numerals. Here the term hybrid fits a little better. Even though in such cases the curved alpha characters may outnumber the curved numerics, here they’re still classed as hybrids. This is because numerals in license plate fonts usually comprise at least half, and in a few cases, all of the characters used in actual plate numbers, so they therefore strongly color the overall appearance. As an example, the most typical case is that a font’s numerals may contain oval arcs (typically with diagonal endstrokes on 6 and 9, and sometimes on 2, 3, and 5 as well) while the curved alpha characters are squarish or semicircular (with endstrokes on straight-sided alphas terminating vertically instead of diagonally). The brown license plate example above illustrates a hybrid font with squarish alphas but numerals using curves based on an oval-arc motif. Why would a font use one style for alphas and another for numerals? It isn’t completely clear whether these types of fonts were designed according to a preconceived plan or simply evolved to be so. However, assuming that the result is purposeful (given the consistent design traits within both alphas and numerals but not with each other), presumably this would be to make the numerals more distinctive from the alpha characters to aid in easy/ accurate plate recognition. For instance, sometimes alphas and numerals may be run together as a continuous string, where different styles for alphas and numerals would help distinguish them. On most plates, of course, alphas and numerals are usually broken into two separate character strings totaling 6 or 7 characters overall (typically 3 + 3 or 3 + 4) as an obvious aid to memory recall. But in either case more unique numerals would help with overall legibility and recall. Compromises dictated by monospacing and viewing distance. So with a font drawn mechanically by draftsmen, the practical solution would be to make the smaller bowls of B, P, and R squarish to open up the counters larger, avoiding both the effect of disproportionately small bowl size on appearance, as well improving legibility at a distance. For a different reason, of course, one also sometimes sees a squarish D, where the bowl is large to begin with, even in otherwise fairly consistently semicircular-theme fonts to better distinguish it from capital O and/or zero at a distance. Or zero may be made square to distinguish it from capital O. In any event, due to these factors, some inconsistency in the design traits of a given auto plate font is probably inevitable. So when squaring of curves occurs in otherwise “semicircular” fonts with the letters B, D, P, and R to maintain more open interiors and/or better legibility at a distance, we’ll be disregarding that particular issue for the purposes of our classification scheme here. Categorized by most recent consistently used font on general passenger issues. Because regular passenger plates dominate the number of plates on the road, the fonts used for these are the ones by which we’ve classified the states, territories, and provinces below. (That said, states who produce embossed plates for general passenger issues but flat digital plates for special issues and vanities may use separate fonts for each type of plate production. More on that further below.) In addition, since the font used by a given state sometimes changes, our classification scheme here generally goes by the most recent font currently in use. A few exceptions to this are that in a handful of states/ jurisdictions, the fonts in use have changed frequently enough that it seemed more logical to put these in the Mixtures/ Hybrids category. Some duplicate use of embossed die fonts between jurisdictions. Note that there is occasional reuse of dies from one state for another state’s plates (sometimes temporarily but other times long-term). In other cases, the dies or AutoCAD drawings for one state’s font may be used as the starting point for another state’s font, with alterations of some characters made when creating the new drawings/dies. The John R. Wald Company’s role as source for most embossed font designs. A point related to the above but seemingly unknown in the license plate collecting community is that the John R. Wald Company, founded in 1924, has been responsible for the creation of nearly all of the embossed tooling — that is, the embossed die fonts — in use on North American license plates today. Not just the United States, in other words, but Canada and Mexico as well. At the plate manufacturing level, this includes the embossed tooling purchased/ used both by prison industries as well as commercial license plate producers contracted by some states, such as Irwin-Hodson of the U.S. and its subsidiary Waldale in Canada. Thus, even in certain instances when an embossed die font is indicated below as coming from Irwin-Hodson or Waldale, Wald would in all likelihood have been the ultimate creator and producer of the font. Wald’s central role here would also explain the reuse or repurposing of embossed tooling or AutoCAD drawings first created for one jurisdiction, but later employed or retooled for another one. License plate production systems suppliers and their roles. Wald itself has not gotten commercially involved producing plates for the states except in limited situations, instead serving as the industry’s dominant equipment and tooling supplier for embossed plate production, and staying out of competition with its customers. In addition to its embossed plate production-line equipment systems, Wald also produces flat digital plate systems (including custom conversions of embossed die fonts to digital form), as well as integrated end-to-end computerized systems that can produce embossed plates digitally in all respects other than the final two stages of stamping and roller-coating the embossed serial-number portion of the plate. Avery-Dennison and 3M are the other well-known suppliers to the industry, Avery manufacturing reflective sheeting only, while 3M supplies reflective sheeting and flat-plate production systems only. 3M has created two digital fonts that we know of for its systems (see links just below). Plate fonts described below are embossed die fonts unless noted as flat/ digital, since the former still comprise the majority of plates on the road. States using 3M’s first digital default font for flat plates, which is based on Univers/ Zurich, have been put into the Semicircular/ DIN-style category here for convenience’s sake, even though the font would be termed a “neo-grotesque sans serif” in type design circles. Also, 3M has now created a second digital font (see flat plate samples only at the link), plus an additional modified variant, based on Minnesota’s embossed die font which looks better than the company’s first digital effort. As well, Wald has to date now recreated digital versions of at least three states’ previous embossed fonts, including Colorado’s specialty plates font, which is probably the best of any digital font so far. (See our assessments of both companies’ digital conversions of these embossed fonts.) Because of this, it didn’t seem worthwhile to create an extra category for digital fonts, since 3M’s initial effort appears to have been an aberration (hopefully not to be repeated), and the design differences between embossed and digital fonts will probably increasingly blur in the future. About the plate example links below. The links below refer to plate photo pages from Plate Shack and 15Q.net, the two most comprehensive collectors’ sites on the net for North American license plate photos. 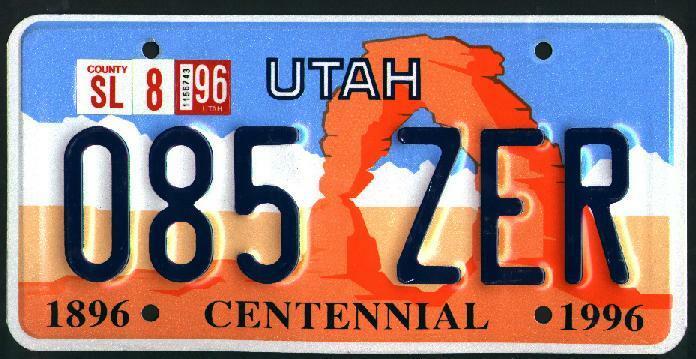 15Q.net’s plate example pages are designated by links abbreviated as “15Q.” Like the “PS” links, 15Q’s plate examples document each year the base plate art for a state’s passenger plates has changed. However, additional plate examples highlighting any font changes are also included in the chronological sequence, when available. A bonus at 15Q rarely seen anywhere else is the well-written commentaries accompanying each plate example. These often provide insight into circumstances behind the plate’s design and manufacture, as well as information about events related to die/font changes when known. Notations of this type in the font descriptions below are thanks to such commentary provided on 15Q.net. If you see any corrections to be made to the font descriptions below, please email . California (PS, PSY2K, PSY2K-2, 15Q): 7-digit. Mostly DIN theme alphas, and oval numerals except 5, 8, zero (numeral 3 intermediate). Serifs on B, D. Squarish O to distinguish from zero. Floating Q. Long diagonal spine on S and top counter much smaller than bottom. The replica font Penitentiary Gothic is based on California’s plate lettering. Louisiana (PS, PSY2K, 15Q): 6-digit. Mostly DIN, although diagonals on numerals are oval-arc style. Maine (PS, PSY2K, PSY2K-2, 15Q): 7-digit-capable but used for 6. 1994 onward: DIN-style. 1993 and previous: Ovalish numerals, softish square theme for alphas. Massachusetts (PS, PSY2K, PSY2K-2, 15Q): 6-digit, mostly DIN, with diagonal-arc tails on 6 and 9, ovalish curves on 2. Angular corner on top half of numeral 3. Missouri (PS, PSY2K, 15Q): 6 digit. DIN-style. Bent angled 2. New Hampshire (PS, PSY2K, 15Q): 7-digit, mostly DIN. Serifs on capital I. Serifless numeral 1, bent angled 2. Use of all numerals on plates starting in 2000. 1999 and prior: 6-digit, DIN-style including alphas with angled tails on 6 and 9. Angled top on 3. North Dakota (PS, PSY2K, 15Q): 6-digit DIN-theme with angled oval-arc diagonals on 6 and 9, gently curved spine on 2. Ohio (PS, PSY2K, PSY2K-2, PSY2K-3, 15Q): 7-digit, DIN-theme with a few squarish (D, P, R, for example), virtually identical to Ontario dies. Short Q. Bent angled 2. Square zero presumably to distinguish from zero. Washington (PS, PSY2K, PSY2K-2, PSY2K-3, 15Q): 7-digit-capable, used for 6. DIN-like overall with exception of small-bowled characters that are squarer like B, P, R; plus D (to differentiate better from zero). Dave Hansen’s License Plate font is a replica based on scans of the state’s plates. Wisconsin (PS, PSY2K, PSY2K-2, 15Q): 7-digit style since 1995, but using 6 digits plus hyphen, except for 7 allowable digits on vanities. DIN theme with exceptions that include diagonal strokes on 2, 6, and 9. Almost identical to Ontario dies other than 6 and 9. Arizona (PS, PSY2K, PSY2K-2, 15Q): Switched to flat plates in 2008 (Mixed/Hybrid). Prior to that, a 7-digit-capable embossed font, used for 6. DIN-theme plus squarish B, D, P, and R.
Idaho (PS, PSY2K, PSY2K-2, 15Q): Flat digital since 2008 (Semicircular). Before that: 7-digit DIN-style embossed font from 1995, with squarish B, D, P, and R, ovalish numeral 2, curved diagonal on 7. Montana (PS, PSY2K, PSY2K-2, PSY2K-3, 15Q): Went to flat digital plates in 2003 (Semicircular). In prior years: 7-digit narrow DIN-style, with squarish B, P, and R.
Tennessee (PS, PSY2K, PSY2K-2, 15Q): Began using flat plates in 2006 (Mixed/Hybrid). 1985–2006 prior to 3M: 6-digit. DIN-style alphas but with serifs on B, D, P, R. Diagonal spine on 2, angled 3, diagonal terminals on 6 and 9. Note: Driver Gothic, which was inspired by Ontario’s license plate font, is also extremely similar to several states’ embossed fonts in this category. In all likelihood, these similar juridictions’ fonts spring from a shared initial set of AutoCAD drawings by Wald for the font dies, with occasional later modifications along the way. District of Columbia (PS, PSY2K, 15Q): Switched to flat digital with 6 digits in 2001. See Mixed/Hybrid category for previous font. Idaho (PS, PSY2K, PSY2K-2, 15Q): Flat digital since 2008 with 7 digits. Indiana (PS, PSY2K, PSY2K-2, 15Q): Flat plates since 2003. 6 digits (although including much smaller 7th-digit alpha character code on plate). Iowa (PS, PSY2K, 15Q): 7-digit using flat plates since about 1999/2000. Montana (PS, PSY2K, PSY2K-2, PSY2K-3, 15Q): Flat digital since 2003 employing 7-digit scheme, but sometimes using only 6 digits depending on circumstances. Nebraska (PS, PSY2K, 15Q): Producing 6-digit flat digital plates since 2005. Nevada (PS, PSY2K, PSY2K-2, 15Q): Began producing flat digital plates in late 2006 in a 6-digit format. Texas (PS, PSY2K, PSY2K-2, 15Q): Switched to 7-digit flat digital plates in 2009. Wyoming (PS, PSY2K, 15Q): Producing digital flat plates since 2001 using 6 digits, with room for a 7th. Colorado (PS, PSY2K, PSY2K-2, 15Q): 7-digit capable since 1993, but currently used as 6 digits. Squarish except oval zero. Serifs on D, none on B.
Florida (PS, PSY2K, PSY2K-2, PSY2K-3, 15Q): 7-digit-capable since 1997 (8 digits possible if plate design would accommodate it), but currently used as 6 digits. Squarish, with sheared corners (same or similar dies used also for Michigan since 2007). Serifs on B and D. 1992 and prior: ovalish numerals, squarish or DIN-like alphas. Vehicle, a font inspired by Florida’s design (though with some differences for design consistency), is also similar to both Michigan and New Jersey’s fonts. Michigan (PS, PSY2K, PSY2K-2, 15Q): 7-digit since 2005. 2007–2008 version became all squarish with sheared corners (Florida’s or Florida-like dies used) — seemingly intended to be a permanent font change, as base plate also changed at same time. 2005 version DIN-like but squarish B, D, P, R. Bent angled stroke on 2. Nearly identical dies to Ontario and Ohio, if not completely so. New Jersey (PS, PSY2K, PSY2K-2, PSY2K-3, 15Q): 6-digit. Squarish font with sheared corners but with DIN-style semicircular zero (since capital O is squarish). Nearly identical to the 6-digit squarish/ sheared font on Florida’s specialty plates. (The latter state uses a more condensed 7-digit version of the same font for its general passenger plates.) One difference is that numeral 4 in Florida’s 6-digit version employs a double-vertex for the left corner of the main triangular counter, whereas New Jersey’s version uses a regular single vertex. Another is the more abbreviated serifs on numeral 1 in New Jersey’s font compared to Florida’s. New Mexico (PS, PSY2K, PSY2K-2, 15Q): 6-digit. Squarish with diagonal tails on 6 and 9, and curved spine on 7. DIN-style zero, presumably to distinguish from capital O, although it’s not clear if the latter is in fact a legal character on plates. North Carolina (PS, PSY2K, PSY2K-2, 15Q): 7-digit. All squarish. Consistently applied theme throughout. The commercially available font Refrigerator Deluxe is nearly identical in design concept, albeit with a little wider characters. Vermont (PS, PSY2K, 15Q): 7-digit-capable, currently used as 6. Same font since 1991. Squarish throughout, with a little more rounded corners than most squarish fonts, except oval-arc spine on 2 and DIN-style zero. Examples of capital O not seen. Oklahoma (PS, PSY2K, PSY2K-2, PSY2K-3, 15Q): Flat plate switch in 2009 (Mixed/Hybrid). Previously, 6-digit embossed font with a squarish design was used. Features of the latter: Angular 3. High-waisted K. Serifs on B, D, P, and R. Fairly similar to Florida’s, including 4’s truncated left vertex, except for the angular 3, though Florida’s P and R don’t have serifs. Early plates in 1960s/70s used dies very similar to Kansas. Iowa (PS, PSY2K, 15Q): Moved to flat plates in 1999/2000 (Semicircular). Prior to that, 6-digit embossed font, squarish, but softer than usual. Nebraska (PS, PSY2K, 15Q): Producing flat plates since 2005 (Semicircular). Prior to that, plates were embossed with a 6-digit squarish font, though with softer rounds on the corners than some; with angled stroke on 2. Nevada (PS, PSY2K, 15Q): Flat-plate state since 2006 (Semicircular). Prior to that, the embossed plates used a squarish font, but with angled curved tails on 6, 9. Arkansas (PS, PSY2K, 15Q): For the last decade or so (including the last few years), the state’s plates have been produced mostly by Waldale using an oval font. Prior to the last few years, there was some alternation in plate production with plates manufactured by Polyvend that have used a hybrid font utilizing DIN-style alphas (but with squarish B, D, P, and R) and ovalish numerals except for a DIN-style zero. Hawaii (PS, PSY2K, 15Q): 6-digit. Ovalish similar to Kansas. Kansas (PS, PSY2K, 15Q): 6-digit. Ovalish throughout. New York (PS, PSY2K, PSY2K-2, 15Q): 2001 onward: 8-digit-capable, currently used for 7. Narrow, oval-curve-style throughout. Fairly graceful for such a narrow license plate font, except for the slight hitch halfway between baseline and cap-height on sides of C, D, G, O, etc. — no doubt an artifact of the AutoCAD-based design. Oregon (PS, PSY2K, 15Q): 6-digit. Oval-shaped with a similar feel to the fonts of Kansas and Hawaii, however there are a few anomalies, though not really enough to push it completely into the hybrid category. Breaking the oval-curve theme are the squarish B and D, while P and R exhibit a more semicircular style. Alabama (PS, PSY2K, PSY2K-2, 15Q): Made flat digital switch in 2007 (Mixed/Hybrid). Prior to that: 7-digit embossed, ovalish curves throughout. South Carolina (PS, PSY2K, PSY2K-2, 15Q): Using flat digital plates as of 2007/2008 (Mixed/Hybrid). Previous years’ plates were 6-digit embossed. Oval curves throughout. Alaska (PS, PSY2K, 15Q): 6-digit. DIN-like alphas. Light-weight oval numerals with end-caps sheared at slight angle on some terminating strokes. Connecticut (PS, PSY2K, PSY2K-2, 15Q): 7-digit-capable since 2000/2001, used for 6. Squarish but some DIN-like. Curved diagonal tails on numerals. Georgia (PS, PSY2K, PSY2K-2, PSY2K-3, 15Q): Current: 7-digit DIN-theme but terminals end at diagonal angle, 2 is ovalish. Serifs on B, D. Short Q. 2000 and prior: Same but less narrow (6-digit). Illinois (PS, PSY2K, PSY2K-2, PSY2K-3, 15Q): 7-digit. DIN-theme with some squarish. Mostly numerals on plates. Diagonal tails on numerals (nice numbers), open 4, curved 7, long diagonal on 2 directly into curved top. Short Q.
Kentucky (PS, PSY2K, PSY2K-2, 15Q): 6-digit. DIN-flavored with ovalish 2, oval diagonal tails on 6 and 9, small/large bowl combo on 8, but DIN zero. B, P, and R bowls are round rather than square. Truck plates are pretty much consistent DIN (added serif on P, though). Maryland (PS, PSY2K, PSY2K-2, 15Q): 6-digit. Alphas — mixture of DIN and squarish. Numerals — mixture of ovalish and DIN. Mississippi (PS, PSY2K, PSY2K-2, PSY2K-3, 15Q): 7-digit-capable, used for 6. Narrow. DIN-style alphas. Ovalish numerals with DIN 8 and zero. Pennsylvania (PS, PSY2K, PSY2K-2, PSY2K-3, PSY2K-4, PSY2K-5, 15Q): 7-digit. Combination of DIN and squarish alphas, plus oval-shaped numerals. Keystone State (a replica font) and Pennsylvania (an “inspired by” version) are both based on Pennsylvania’s plates. Rhode Island (PS, PSY2K, 15Q): 6-digit font used for 5. DIN-theme alphas with smaller-bowled characters squarer. Mostly DIN-style numerals but hooked diagonal tails on 6 and 9, ovalish 2, slightly curved 7. Utah (PS, PSY2K, 15Q): 6-digit. Squarish alphas. Numbers DIN-style but with oval-arc diagonal tails on 6 and 9, which both have significantly smaller counters than the norm. Angled 3, odd nearly disconnected counters on 8 (probably to distinguish from B), top serif on J, straight diagonal spine on S directly connecting with curved top/bottom. West Virginia (PS, PSY2K, PSY2K-2, 15Q): 6-digit. Squarish alphas. Numerals close to official DIN. Alabama (PS, PSY2K, PSY2K-2, 15Q): 7-digit. Switched to flat digital plates in late 2007. Arizona (PS, PSY2K, PSY2K-2, 15Q): 7-digit, using a modified version of 3M’s second flat digital font since 2008. Minnesota (PS, PSY2K, PSY2K-2, 15Q): Flat digital since 2008. 7-digit font but used for 6. 3M’s second digital font used by the states in this sub-category is based on Minnesota’s previous embossed font. Oklahoma (PS, PSY2K, PSY2K-2, PSY2K-3, 15Q): Flat digital switch made in 2009. 7-digit-capable, currently used as 6. South Carolina (PS, PSY2K, PSY2K-2, 15Q): Producing flat plates since 2007/2008. South Dakota (PS, PSY2K, 15Q): 6-digit. Began using flat plates in 2006. Tennessee (PS, PSY2K, PSY2K-2, 15Q): Flat plates since 2006, using 6 digits. Delaware (PS, PSY2K, PSY2K-2, 15Q): 7-digit-capable but used for 6. Delaware’s plates had been flat but screen-printed for many years prior to its switch to digital plates in 2002. Up until that time, its plates used a classic-style font following a DIN-like design template with ovalized influences. When the switch to digital production was made, a pseudo-condensed version of Arial was substituted to much subsequent public outcry. Over the following few years a couple of different attempts were made to create a new digital design that matched the previous screen-printed plate font, with a reasonably close facsimile of the traditional font achieved by late 2006. Numbers only are used on the general passenger issue. As mentioned, the font design is mostly DIN-like with a bit of ovalized-curve influence, plus a couple of other differences: The endstrokes on otherwise-DIN-like 2, 3, 5, 6, and 9 are angled (rather than vertical), numerals 2 and 3 are constructed with an overall oval-curved theme, and numeral 4 includes a bottom serif. District of Columbia (PS, PSY2K, 15Q): Switched to flat digital plates in 2001 (Semicircular). Prior to that: 6-digit embossed hybrid font with DIN-style alphas and oval numerals (except for DIN zero). Unique 3 combining angled top with oval bottom, though not particularly attractive. Indiana (PS, PSY2K, PSY2K-2, 15Q): Switched to flat digital in 2003 (Semicircular). Before that, 6-digit embossed font based on oval curves (and using same 7th-digit smaller alpha code). Plate serials both then and now have used all numerals other than the lone single-digit alpha code. The previous classic embossed font was a hybrid of oval-curve alphas plus mostly DIN-style numerals with some ovalish elements thrown in, such as the diagonal-curve tails on 6 and 9, and oval-arc curve on spine of both 2 and 7. Minnesota (PS, PSY2K, PSY2K-2, 15Q): Moved to flat digital tags in 2008 (Mixed/Hybrid). 7-digit font but used for 6. Previous embossed plates used same font design — squarish alphas but with numbers based on oval curves — and was used as the model for 3M’s second flat digital font. South Dakota (PS, PSY2K, 15Q): Began producing flat plates in 2006 (Mixed/Hybrid). Prior to that, used a 6-digit mostly DIN-style font from 2000–2006, but some years were squarish. Hooked diagonal tails on 6 and 9. Diagonal central stroke many years, but ovalish another year. Texas (PS, PSY2K, PSY2K-2, 15Q): Switched to flat digital font in 2009 (Semicircular). Before that, 7-digit-capable embossed, but spaced widely and used for 6. Combination of DIN and squarish alphas, with ovalish numerals. Letters are often high-waisted such as K, P, R, S, X, Y, or the bend in 7. Open 4 like California’s. Wyoming (PS, PSY2K, 15Q): Switched to flat digital in 2001 (Semicircular). Previous embossed plates employed a 7-digit-capable font, though used for 5, 6, or 7, with ovalish numerals. Alphas were mostly DIN with some oval, though not as prominent, either at smaller size on plate using a two-digit stacked code, or single-digit code at full-size. Virginia (PS, PSY2K, PSY2K-2, 15Q): 7-digit. The only book-typography font style with bracketed (tapered) serifs seen on any Western country’s license plates. (All other license plate fonts are sans-serif — with only occasional slab-style serifs added on some letters to prevent confusion with similar characters.) Numerals have some resemblance to Times Roman in condensed form. The serif style of the alphas is different, with characters inconsistent in form and weight from one character to the next. Note: All North American general passenger-issue plates outside the U.S. are embossed. Canal Zone (PS): 7-digit-capable but used for 5. DIN-style since 1976. Puerto Rico (PS, PSY2K): 6-digit consistently used die style since 1973 for passenger plates. DIN-style but more squarish on smaller bowls (B, P, R). Diagonal hooked tails on 6 and 9, ovalish 2. Recent specialty plates as of at least 2008 use 3M’s newer 6-digit digital font printed on flat plates. Virgin Islands (PS, PSY2K): 6-digit. Up through 2004, the general passenger issue used oval-style embossed dies of a consistent make since 1993. In 2005, the dies used are the Irwin-Hodson DIN-style font employed on Mississippi’s plates and those of several Canadian states (see below). Specialty plates have used a few different fonts including Colorado’s squarish digital font. American Samoa (PS, PSY2K): 6-digit-capable, used for 4. Numerals only, oval-style, though there has been little stability in the font style with several changes over the years. One guess as to the reason for the frequent font changes over the years may be that various prisons in the 48 continental states were contracted to print the plates, since such a small terroritory would not normally have the facilities to print the plates themselves. Guam (PS, PSY2K): Frequent changes over the years. Currently uses what appear to be Alaska’s 6-digit oval dies for numerals, however alphas are thicker, small-size DIN-style. As with American Samoa above, the frequent style changes may be due to different prisons in the mainland U.S. having been contracted to print the plates from one time period to another. British Columbia (PS, PSY2K, 15Q): 6-digit DIN-style. Northwest Territories (PS, PSY2K, 15Q): 7-digit-capable font, but used for 5 digits on small plate stamped out in the shape of a polar bear. This embossed font takes the Neo-Grotesque typeface Univers as its obvious model, and therefore falls somewhat outside the typical license plate font style categories. What’s interesting about this is that Univers was the original typeface designed in 1956 that a later typeface, Zurich, is an inexact clone of. Zurich is in turn the typeface on which 3M based its first digital default font which has been heavily critiqued elsewhere in this article. Differences between the Northwest Territory implementation compared to 3M’s digital takeoff are that it’s less condensed and also is not monospaced, retaining Univers’ proportional spacing, which together open up the counters some and improve the legibility somewhat. Nunavut also uses the same dies, and the proportional lettering (for example the wide letter M) can be better seen in the link given below for Nunavut. Nunavut (PS, PSY2K, 15Q): Same 7-digit-capable font as the Northwest Territories (see above), but used for 6 digits (despite just 2,000 registered vehicles) on small plate stamped out in the shape of a polar bear. Nunavut used to be part of the Northwest Territories and therefore retained the same polar bear plate after separation since Nunavut is where most of the bears are concentrated. Ontario (PS, PSY2K, PSY2K-2, PSY2K-3, 15Q): 7-digit, DIN-style except zero, D, and small-bowled B, P, and R. This font was the inspiration for Driver Gothic designed by Canada Type, which is based in Toronto, Ontario. Quebec (PS, PSY2K, 15Q): 6-digit squarish style. Saskatchewan (PS, PSY2K, 15Q): 6-digit. Squarish throughout with only a few exceptions. Diagonal tails on 5, 6, and 9. Sheared corners on Z. Diagonal spine on 2, top half of 3 angular, double left vertex on 4. Unique 5 with unusual transition from square top to diagonal/oval bottom. Horizontal top strokes on 5 and 7 are terminated with angled cut. Manitoba (PS, PSY2K, 15Q): 6-digit Waldale oval dies. New Brunswick (PS, PSY2K, 15Q): 6-digit Waldale oval dies. Newfoundland and Labrador (PS, PSY2K, PSY2K-2, 15Q): 6-digit Waldale oval dies starting in 2007. Previously, Irwin-Hodson 6-digit DIN-style dies had been used from 2004–2005, which were a variant of the 7-digit DIN-style Irwin-Hodson dies used by Mississippi. The switch was due to Irwin-Hodson and Waldale having merged in late 2006/ early 2007, with the Newfoundland contract returning to Waldale in Canada. Nova Scotia (PS, PSY2K, 15Q): 6-digit Waldale oval dies, using a version since 2002 that’s very similar to but slightly different from the oval Waldale dies used for Alberta, Manitoba, and New Brunswick. See David Nicholson’s discussion at 15Q.net for a bit of additional insight (bottom of page). Prince Edward Island (PS, PSY2K, PSY2K-2, 15Q): 7-digit-capable (as seen on vanity plates), used for 5 digits on general passenger issues. DIN-style alphas similar to Ontario’s plates, but numbers have a more ovalized-curve theme (other than 8 and 0 which are DIN-theme) such as 2, 3, and 5, the curved diagonal on 7, and the diagonal tails on 6 and 9. Yukon Territory (PS, PSY2K, 15Q): 6-digit, used for 5. Font design has varied over the years due to the production contract going back and forth between competing vendors, and the fonts for any given contract may themselves be hybrid in design. As nearly as we can tell, the style since 2003 uses an ovalized font, but may be changing as of 2008 back to a DIN-style with a few ovalized elements that had been used at other times in prior years. PS, PSY2K, PSY2K-2, 15Q – Although the Mexican states have had individually designed base plate graphics since 1998, the same font is used on all. Prior to 1998, Mexican plates regardless of state shared a common base plate design identical in every respect except for the state identifier, containing only plate letters/ numbers and no graphics. The current font since 1998 is a 7-digit oval die font with almost the same design as the previous 7-digit font, but smaller in size, the previous one having been the same larger size normally used on U.S. and Canadian plates. Both pre- and post-1998 fonts contain oval curves with a design very similar to U.S. states such as Kansas and pre-2007 Alabama. (One notable difference, though, is a long, straight diagonal spine on capital S compared to the all-curved S’s in most other oval-theme fonts.) Other than the reduction in size, the post-1998 version retains all but a couple of features from the pre-1998 font. The previous numeral 4 had a single left vertex that has now been truncated, so that in its place are two closely spaced vertexes with a short vertical connecting stroke. Also, the W now has perfectly vertical sides rather than slanted, and appears to be identical to M except turned upside-down.